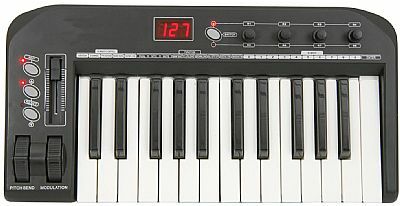 The Chord MU25 MIDI/USB Music Controller Keyboard with full size velocity-sensitive keys for use with MIDI sound modules or PC/Mac via USB. Additional control is available via assignable pitch and modulation wheels, slider and 4 dual function rotary encoders. Further menu and parameter settings can be edited from the Edit and +/- keys in combination with the note keys and 3-character LED display. Designed as a central part of any DAW system and for live MIDI control. Expression wheels (assignable): Pitch (sprung) and Modulation. Parameter control (assignable): 1 x slider, 4 x dual function rotary encoders. 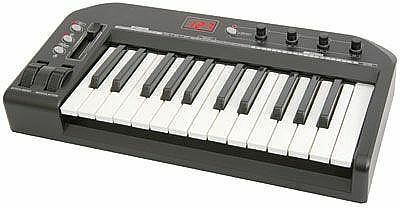 Connections: DC input, USB B, Pedal input, MIDI output.